This is a case study of a summary criminal prosecution in the Magistrates Court of Queensland for fisheries offences. 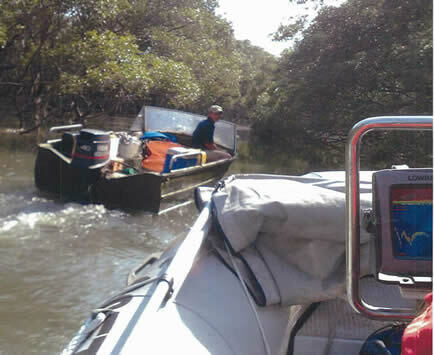 In November 2009 and December 2009 Queensland Fisheries officers apprehended the offender in two tributories of Moreton Bay adjacent to Brisbane in South East Queensland. The fisherman was subsequently charged under the Fisheries Act 1994 (Qld). He pleaded guilty to all of the charges and was fined $30,000. Summons to appeal for both complaints. Maps showing the locations of the offences in tributories of Moreton Bay. Photographs of offender being apprehended and fishing gear located in his boat in December 2009. Prosecutor's submissions on sentence (which include a detailed description of the background and nature of the offences). A ministerial media release in relation to the $30,000 is available here. Thanks to the Queensland Department of Employment, Education and Innovation (DEEDI) for the materials used in this case study. Photographs of the offender being apprehended and the fishing gear located in his vessel.